It was the largest manhunt in history - ten thousand federal troops, detectives and police hunted those responsible for the assassination of President Abraham Lincoln. The conspiracy was vast - an effort to decapitate the United States government at the end of the Civil War. The manhunt was intense - ending 12 days later in a fiery showdown with the man who pulled the trigger, John Wilkes Booth. The show is based on Michael Kauffman's highly praised book, "American Brutus". Since 2007’s hit National Treasure: Book of Secrets related to the blame for the Lincoln assassination, it makes sense for a History Channel documentary called The Hunt for John Wilkes Booth to coincide with the flick’s DVD release. As you can infer from the title, this program purports to tell us what happened to Booth after he took the president’s life. Story examines history via the usual mix of archival materials and interviews. We hear from historians Roger McGrath, Terry Alford, American Brutus author Michael Kauffman, Team of Rivals author Doris Kearns Goodwin, biographer Betty Ownsbey, and the US Marshals Service’s John Clark. The documentary covers the details of the assassination plot – which planned to take down Vice President Andrew Johnson and Secretary of State William Seward as well – along with its implementation and aftermath. We find details about the participants, the atmosphere after the end of the Civil War, aspects of the assassination, and the investigation that followed. That side of things dominates, as the show follows attempts to capture Booth and his co-conspirators, but we also learn of the act’s impact on society and the status of the US during the period right after the assassination. Too many documentaries take history and bludgeon it into boredom. Happily, Hunt offers a good balance of techniques to ensure that it gives us a lively examination of events. As I already mentioned, the piece uses interviews with experts and shots of archival pieces including documents, newspapers and pictures. The latter can become tedious – with so few photos in existence back in the 1860s, we see the same shots of Booth and his colleagues over and over again. I can’t fault the creators of the show for that, of course, but we do get sick of those same pictures. Anyway, those techniques work fine, and Hunt also integrates a lot of dramatic recreations. These use actors to play Booth, Lincoln, and all the others involved in the tale. Typically, these sorts of reenactments are so cheesy that they harm the product, but I think they succeed here. The fact that narration covers them helps; I feel the shots would’ve become less effective if we heard the actors speak too much, as we then have to deal with any drawbacks they possess as performers. The recreations tend to come and go quickly, which allows them to embellish the material and not drag it down with tacky theatrics. Hunt provides a brisk examination of events. It zips through the chronology but doesn’t seem rushed. Instead, it takes on the topics in a concise manner. Of course, it lacks great detail, but that’s inevitable for any 90-minute documentary. If you want real depth, you need to get a book. For a quick overview, Hunt proves efficient and informative. Really, I can’t think of anything about The Hunt for John Wilkes Booth that doesn’t work well. The show includes a good historical examination of important events in does so in a manner that keeps our attention. This is an entertaining documentary. 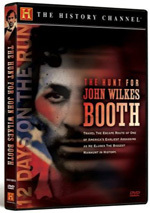 The Hunt for John Wilkes Booth appears in an aspect ratio of approximately 1.78:1 on this single-sided, single-layered DVD; the image has NOT been enhanced for 16X9 televisions. 2008 seems awfully late in the game for a non-anamorphic transfer, and that factor meant that Hunt offered mediocre visuals. For the most part, sharpness was acceptable. Definition never seemed great, and a bit of softness interfered on a pretty consistent basis, but the picture never showed bad delineation. Though it looked a little loose, it wasn’t painfully “off”. Mild instances of jagged edges and shimmering appeared, but edge enhancement was absent. Source defects also weren’t a real issue, though some minor video artifacts appeared. For the interview shots, colors looked pretty good. They demonstrated natural, concise hues much of the time. The recreations went with more of a blue tone that was a bit unnatural, but the colors remained fine. Blacks were a little inky, and shadows tended to be somewhat dense. Those recreations offered a lot of night shots, and they were usually a little too tough to discern. All of this added up to a “C” presentation. Don’t expect much from the Dolby Stereo 2.0 soundtrack of Hunt, though it seemed perfectly satisfactory for this kind of project. Not much came from the soundfield. Music showed minor stereo imaging at times, but that was about it. Some effects may have emanated from the sides on a few occasions, but I honestly didn’t notice anything substantial. The surrounds bolstered the score and did virtually nothing else. Audio quality was decent. Speech sounded natural and concise, without edginess or other issues. Music and effects appeared acceptable, though not particularly dynamic. I thought the track worked well enough for a “C”. It’s a documentary, so I certainly didn’t expect anything exciting. No extras accompany the DVD. No added scenes, no commentary – nuttin’! Although I feared that The Hunt for John Wilkes Booth would become a dry recitation of events, the documentary actually proves to be quite lively. It moves at a nice pace and offers a solid overview of history. This isn’t much of a DVD, though. Picture and audio are average, and it includes no extras. I like the program enough to recommend a rental, but I don’t think the disc merits a purchase.